There’s a Tom and Jerry cartoon where they both commit suicide,that's the final episode ! Tom and Jerry was a series of lighthearted cartoon episodes that centered on the rivalry between a cat and mouse. Most episodes are innocent and fun, but one is very different. Almost universally accepted as one of the most controversial children’s cartoon episodes of all time, in the episode Tom falls in love with a female cat and showers her with gifts, only to have her stolen away by another cat, Mr. Butch. Tom becomes an alcoholic and falls in a drain, from which Jerry has to save him from drowning. Jerry then encounters a similar problem and watches his love drive away with another mouse. The most controversial part? 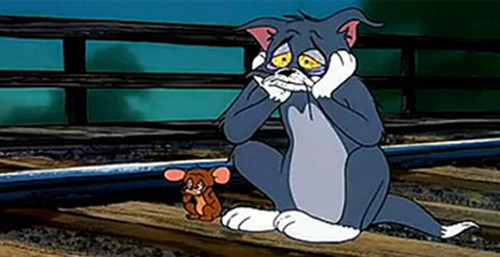 The episode ends with both Tom and Jerry drunkenly sitting on train tracks. As Jerry sits, the train is heard approaching with neither character ready to move, seemingly committing suicide. Watch the cartoon and give us your thoughts below! A tiger's tongue is rough enough to lick the paint off of a building. facts4you2 is licensed under a Creative Commons Attribution-NonCommercial-NoDerivs 3.0 Unported License.